Getting students to carve out time for God can be tough. Between packed schedules and the daunting weigh of the average Bible, students need a simple, organized way to deepen their relationship with God on a daily basis. 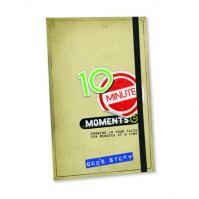 Each edition works like a daily journal with 31 relevant devotionals that only take about 10 minutes to complete. Students will read a Bible passage, get some questions to chew on, some suggestions to help them pray, and then space to reflect. It's easy to read and easy to stick with. This edition is focused on God's story—who He is, what He has done for us, and how we can live a life that brings Him glory. It's got great lessons for new Christians as well as students who have “grown up in the church”. Use them as part of a small group or retreat emphasis on daily devotions, graduation gifts, birthday gifts, or just have them available to students.